SI.com writer Andrew Sharp spent 72 hours with the Boston Celtics. Here are the takeaways that did not make it in the magazine. Get all of Andrew Sharp's columns as soon as they’re published. Download the new Sports Illustrated app (iOS or Android) and personalize your experience by following your favorite teams and SI writers. A few weeks ago, I spent some time in Boston for a feature on Brad Stevens and the state of the Celtics. You can read that here. Of course, magazines are not the internet, so we had to cut a bunch of stuff to put it together for print. But this is the internet, and now we have endless amounts of space. With that in mind, here are six more Celtics takeaways that didn’t make it to the magazine. I didn't want to write about the tradition. It's the most cliche angle imaginable. You do feel it, though. As a Wizards fan, I was truly disgusted by all the success in the air. "It's such a unique place," Tom Thibodeau says. "There's 17 championships. No one's been able to sustain the success the Celtics have. The people are really what makes it special. When you come around here and see all the former great players, [35-year media coordinator] Jeff Twiss, [Hall of Famer] Tommy Heinson. Guys like Danny Ainge are a connection Red Auerbach. You don't want to let that tradition die. You feel that. It's a special place to be." You do feel it. Walk around the stadium before a game and even the energy from the surrounding bars is different than you'll find before games in most cities. Inside, retired stars from several different decades are milling around with the teams playing today, beneath banners from 60 years ago. The value of all this is difficult to define, but it shouldn't be discounted. "If you play for the Boston Celtics," Jae Crowder says, "you know the history. We're in the practice gym every day seeing all these banners. As a player, you want to keep that going. That inspires you." "We talk about it," Stevens adds. "I don't think they feel pressure from the tradition, but they feel a responsibility. How you need to play in this town. There's reality in that." "We're in a city where sports is a big, big deal," Crowder says. "What makes it even more fun is the fans appreciate it," Evan Turner says of his time here. "We're having sellouts, crazy crowds, everything's clicking on the basketball side and the atmosphere, too." Players take notice, fans feel a connection that doesn't exist elsewhere, and the standards are a little higher for everyone involved. That's the Celtics tradition. It's incredibly corny to discuss this in mixed company, but that doesn't mean it's not cool. Also, on a more basic level, all this is one more reason for everyone to be pissed off that this is the team that swindled the Nets. Most teams don't have a) 17 titles to keep fans invested, b) Brad Stevens, c) Nets picks, or d) two Hall of Famers and an All-Star (Rondo) to trade once rebuilding starts. It really isn't fair to compare this team to some of the other rebuilding projects. There's only so much the rest of the league can learn. But if there's one quality that could be applied anywhere, it starts with the people in charge. Stevens mentions this dynamic specifically when he discusses his move to the NBA. "Well first of all, it's flattering to hear from the Boston Celtics," he says of the initial call that Ainge made in 2013. "But I'd been really fortunate to be courted by some schools, too. It was going to be hard to leave Butler unless it was for the right people and leadership team. We talked the day after the [Nets] trade, and then we talked more that weekend. It was a process. I had to be comfortable with the people." "I didn't bring in 50 different people," Ainge says. "I spend my life watching NBA games, college games, European games. I like to go by what I see happening on the court. [Watching Stevens] I was always very, very impressed." Stevens explains why he came around: "I felt like with Danny, and the owners, and how committed they were, to the process of growth with this new team we were gonna have, I felt really comfortable with that. And I've been really validated with that since I've been here. Even when we weren't as good, or I've made mistakes in games, or we didn't pull out a win, I always felt like I was really supported. It's not easy when you play 82 games. Those are 82 times you can ride the emotional roller coaster, and our leaders are just really even keel." The common thread is trust. Wyc Grousbeck and the owners trust Ainge to hire the right people, Ainge trusts Stevens, and Stevens trusts the players Ainge chooses. That was the most impressive thing I saw in Boston. Everyone is smart, but also willing to trust to the other people in charge. There's no meddling, and in part because of Grousbeck's stability and trust, everyone's operating from a place of security. This doesn't exist with most NBA teams. Look at the way the Cavs have been run with Dan Gilbert and LeBron James the past few years. Look at the Pelicans and the way chaotic ownership trickled down to Anthony Davis and three lost seasons. Look at the Lakers, the Bulls, the Knicks, or a dozen other teams operating from three different playbooks at once. In Boston, every level of the organization is competent and thoughtful in the way approach things, and they're working with the same blueprint. Banners in the practice facility are cool, but the foundation of success is here. "I saw it a little bit at the collegiate level," Stevens says of his point guard. "You had a team that was pretty good, and then you could plug in one guy who just made it soar. Isaiah kinda meant that to us." It cannot be overstated how questionable the Isaiah Thomas trade was at the time. He was a very good offensive player, but Boston was a team stuck in the middle of the East. They needed to tank. Brad Stevens was such a good coach that tanking had already been harder than expected. Giving him more firepower felt awfully counter-productive. And last year, it absolutely was. The Celtics won a few more games down the stretch to slide into the seventh seed. This gave them the privilege of being swept out of the first round by Cleveland, and it meant they missed out on a place in the top 10 of the draft. This season the gamble paid off. Stevens continues: "We were missing a guy in transition and in the pick-and-roll, who could do what he does time and again. Everybody can have their moments, but he does it time and again. That's added a different dimension to our team." As Jae Crowder explains it: "He has little man syndrome. You know every little guy thinks it's him against the world. But I love it. He's gonna be ready to play each and every night, he's a heck of a scorer. He loves to win. His competitive nature is up there with the best of em. If you look to your left and you know you've got a guy who's willing do the same things you're doing, that's a guy you want to play with. That's exactly what he brings to the table. " He's averaging 22.5 points per game and 6.5 assists, and terrorizing teams on the pick-and-roll. He's so much more than the Nate Robinson sequel everyone had pegged him for, and now the Celtics are more than a seventh seed. "They embrace what I do," Thomas says. "They want me to be who I am." Most importantly, there's the bigger picture: If trading for Isaiah Thomas cost this team a chance at a top 10 pick last year, he's also the biggest reason they've improved enough to talk credibly about a building a title contender this summer. If Isaiah Thomas is the driver for this team, Jae Crowder is the engine. "Offensively, defensively," Thomas explains, "He keeps us together. He's proved a lot of people wrong. He's another guy who found an opportunity and he's taking advantage of it." "I was held back in Dallas," Crowder says. "I wanted to get out and be able to prove myself in this league. It's all about the opportunity. I was given the opportunity when I arrived to play, and to be something. I had coaches who believed, and it just started coming together." He's turned into one of the best two-way players in the NBA, and he's the clear MVP on this Celtics team. He got hurt recently, and the team lost four straight games before righting the ship against the Sixers and Magic. When he's healthy, he's the linchpin to one of the best defenses in the league, and helps the set tone for a team that's played the whole season at 150 miles per hour. "It starts with how we as a team identify ourselves," Crowder explains of this team's success. "That starts with playing great defense. Once we identify what we can control, that's our defense, that's our effort. We let the rest take care of itself." "We started really moving in a good direction," Stevens says, "as we continued to get guys who had that chip on their shoulder, and had that fire to prove something." Danny Ainge has a type: "Listen, I like the Jae Crowders, the Marcus Smarts, the Avery Bradleys. Isaiah Thomas, what that guy does at his size, he's as scrappy a guy as there is in our league. I do gravitate to those types of players, the Tony Allens, Delonte Wests. Those are some of my favorite players." And one Evan Turner quote explains the whole season: "We compete. We don't care who gets the credit. That's actually kinda special in this league. We're legitimately happy somebody else starts. We push each other, but nobody's hoping another person will fail, nobody's hating on each other, it's dope. Anytime you lose yourself in something bigger than you, it's really cool. Especially at this level, a lot of people are chasing other stuff." Watch this Vine, and when it's time to vote for Sixth Man of the Year, make your voice heard. "I wasn't really trying to trade Kevin and Paul," says Ainge when asked about the deal that currently makes Boston's future twice as bright. "I had sort of resigned myself to the fact that Kevin and Paul would remain Celtics and retire as Celtics. There really hadn't been much momentum, or even tempting opportunities to move them, until Brooklyn came along and made an offer. It sort of came up last minute, right before the draft." 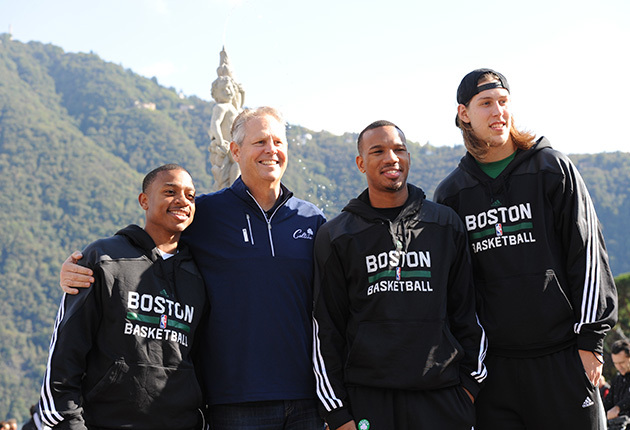 "We needed some direction," Ainge says of the Celtics in June 2013. "It's tough when you have aging veteran guys and young guys trying to mix. But at the same time, we would love to have our young core group of guys be mentored by KG and Paul. There was a lot of good things that could have happened either way." "No way," he says when asked if he knew how valuable the picks would be. "I actually thought Brooklyn was going to be really good. I was excited for Paul and KG. For Brooklyn to be able to acquire those guys, they still had basketball left in 'em. I was excited for them to go together and play with three young stars like Lopez, Joe, and Deron. I thought they were going to be a very, very good basketball team." Plenty has been written about this already. I just want to say that I could spend at least eight hours listening to Danny Ainge explain why the Nets trade actually made sense for everyone. 6. Picks and cap space make everything more fun. "We'll be trying to take it to another level," Ainge says of the offseason. "Every team will. It just takes good fortune." "When we were able to make the trades for Ray and KG,” Ainge continues. “That was just good fortune. That wasn't any genius or anything else. We put ourselves in position, and people liked some of our guys, and we were able to make a deal. People want to tie it to me and Kevin McHale, and I think there's some truth to that because we were able to have open dialogue. But Kevin ultimately liked our guy Al Jefferson more than he liked Andrew Bynum. And rightfully so." So far, there has been no McHale, and no blockbuster good fortune. This team has been fun, but there's a ceiling. Without a superstar tying this together, there’s almost no margin for error against a good team. In the playoffs, that becomes a problem. But that's half the appeal with this season. None of it's finished, but it's all far enough along to start thinking bigger. They have picks... they have cap space… For now, the Celtics combine the two best parts of being a basketball fan. 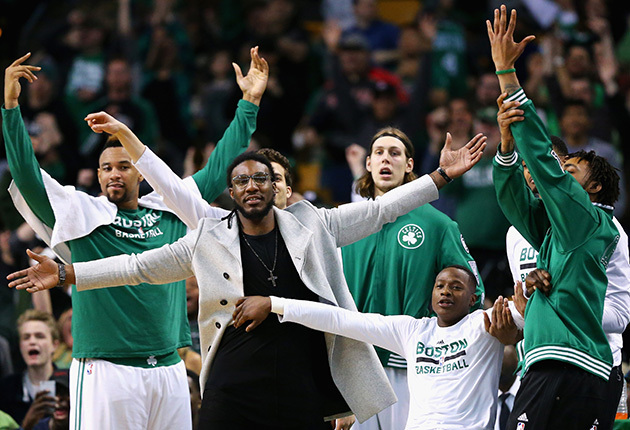 At 7 p.m, you can watch Jae Crowder and Evan Turner throw their bodies all over the floor and win games. Then by 10 p.m., you can dream about all the craziest places to take this over the summer. As I wrote in the magazine, Stevens probably guarantees a baseline of success regardless of where this goes. But I think I like following this team because of Ainge. He's very smart, and also just crazy enough to keep things interesting. Sometimes this means the Isaiah Thomas trade. Last June, it meant a furious quest to trade four first round picks for Justise Winslow. At one point, I'm pretty sure it meant James Young was absolutely off-limits in a trade talks. A few years ago, it was a mission to trade for Kevin Love with Kelly Olynyk and Jared Sullinger. It will be a fun summer.